Mosquito adults are small flying insects that often bite and are annoying. 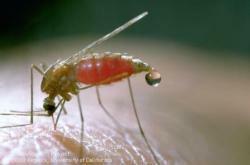 The females require blood from humans or other animals to develop eggs, and mosquito bites may transmit organisms causing diseases such as West Nile Virus. Mosquito larvae live and grow in ponds, objects containing standing water, and other aquatic sites. Decrease your chances of getting bitten by reducing standing water around your home, using repellents, and wearing protective clothing when outdoors. Empty water from unused garden pots and other objects. Store containers upside down or cover or dispose of them, so mosquitoes can’t lay eggs. Change water in pet dishes, watering troughs, and bird baths at least weekly. Avoid overwatering which can lead to standing water. Keep litter and garden debris out of street gutters. Clean rain gutters and downspouts at least once a year to remove debris. Seal rain barrels, so mosquitoes can’t breed in them. Keep all filters and pre-filters clean and free of moisture-retaining debris and inspect regularly for leaks. For ponds, remove excess vegetation, stock with fish, or use Bacillus thuringiensis (Bt) products such as Mosquito Dunks, Plunks, or Bits, which contain a bacterial agent that kills mosquito larvae but doesn’t affect people, other animals, or plants. Maintain water quality in swimming pools with chemical treatments. Keep water off swimming pool covers. Cover or drain water from plastic pools when not in use, so mosquitoes can’t lay eggs in them. Fill open tree holes with sand or mortar. West Nile Virus is spread by mosquitoes that get the virus from infected birds. Once infected, mosquitoes then transfer the virus to humans and other animals. Infected humans can become ill. The disease usually is most serious in children, people with weakened immune systems, and the elderly. For more information about West Nile Virus, contact the California Department of Health Services. The best defense is to avoid mosquito bites! Be sure doors and windows are properly screened. Avoid being outdoors at times of the day when mosquito activity is high in your area, especially at dawn and dusk. Wear long-sleeved shirts, long trousers, socks, and a hat if you must be outside when mosquitoes are present. Use insect repellents containing DEET, picardin, or the slightly less effective Oil of Lemon Eucalyptus (PMD). Repellents containing other ingredients are less effective, so you must frequently reapply them. Outdoor insecticide sprays can temporarily reduce the number of adult mosquitoes but have no lasting effect.